May has been a busy month but one of the highlights was an all expenses paid work trip to Centre Parcs. This was a 3 day, 2 night stay free of charge provided by our company in celebration of 20 years of business. As all good things, it started with food. We started off with an early dinner in Walkabout – a brand new Australian themed bar having taken the place of another bar some months before. 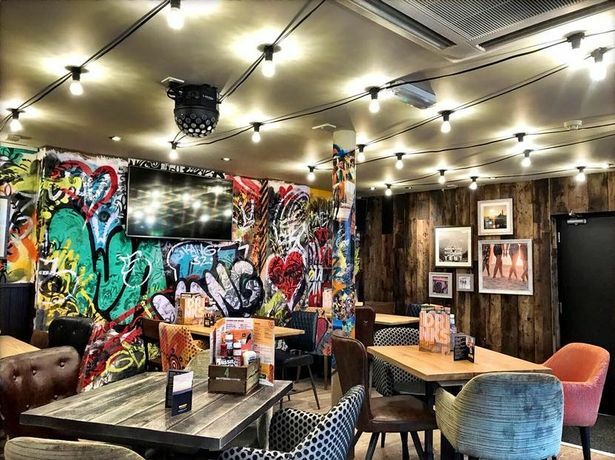 It’s edgy without the exclusive feel some modern bars have and comes with a well stocked bar of craft beers, wines and spirits, as well as a new menu. I ordered the Walkabout Club which comes with a soft drink for £6.00 off the lunch menu, and for the size of it, I thought was good value. And yes, it tasted as good as it looked. I enjoyed it so much I went back a few weeks later and had it again. Yum. From Walkabout it was time to buy supplies for the weekend. We can pretend that there’s good healthy food in there, but we’d be lying to ourselves. Unless by healthy food, you mean Vodka. Once the important things were done, it was a straight drive to the Forest (minus a near miss on the roundabout of death). Nestled in 400 acres of beautiful forest, sits the 5 star British holiday destination of the upper to middle classes. Nothing rammed this home more than when we clambered up our driveway, clinking more than a bottle bank. Or when you drop you car off, thinking what you drive is quite nice only to find the car park full of Evoques and Porsches. We had been assigned a lodge in groups but because 2 of our 4 had already dropped out we pretty much had it to ourselves. It was basically as-new, with all lodges having recently undergone an extensive renovation across the whole parc. Everything was spick and span and couldn’t be faulted. If you’re rich with children, Centre Parcs is one of the holiday destinations in the UK. It has everything: unlimited swimming, pottery painting, horse riding, 5 star spa, cycle hire, bowling, sports clubs, kids clubs, country clubs, everything… It is a self-ran village complete with Starbucks and mini-market. If you’re poor like the rest of us, you’re lucky to be invited on a day trip with rich friends. But it is beautiful, and packed full of semi-domestic wildlife and trees. So many trees. Of course we were there for none of that. After a relaxed evening of pampering and applying our Primark nails (winning), Saturday started off with a three hour conference to celebrate our company’s 20th birthday. This was followed by a lovely lunch in one of the diners – Hucks, who served up buffet-style American and Latino inspired food. It was a good job plates piled up because little did we know we’d need the energy for what would be occurring next. A 3 HOUR ORIENTEERING EXERCISE COVERING THE ENTIRE PARC IN 22 DEGREE HEAT. An hour and half in and we were all drinking at the bar. Some hours later, merry and sun burnt, we staggered walked back to our lodges to shower and dress for the evening highlight; The Spring Ball. The reason we had all travelled to this expensive wonderland. An opportunity for every man and woman to slip out of the crusty work trousers and transform into swish. And it wasn’t just the people that transformed. Where we had our conference earlier that day perfect white cloths now covered each table and chair, ice buckets containing mixtures of wines and beers complimented each table around the centre pieces, and Prosecco greeted each person on arrival. The site catered a sit-down three course meal which was absolutely delicious. Everything was cooked perfectly and served swiftly, no easy feat when there’s 300 of you. The staff were incredible, moving through us but not into us, carrying plates up each arm to and from the kitchen. We were allocated seats randomly although most of us were sat with members of our orienteering team from earlier. Soon all social niceties were abandoned and conversation flowed with ease. More alcohol was poured and with a few well timed trips to the bar much of it was paid by senior management thank you very much. And of course, the dancing. We won’t go into the shenanigans of that night (there were shenanigans) except to say the next morning was not pretty. There was a point early on in the night where I stopped taking photographs because we moved past ‘nice’ into three chin territory, so in fear of retaliation they will stay on my phone. The next morning although we had full access to the facilities, we went for a gentle swim to ebb the headaches before picking up lunch and beginning the sunny drive home. It would have been nice to spend more time there but everybody was done from the night before. It was a really wonderful weekend. Considering our company paid for the whole thing I don’t feel anybody has the right to complain about it (not that they are). The staff at the resort were beyond lovely, the service was always efficient and the amenities were just right for what you needed. And a final thanks the the great British weather, which played it’s part to the hilt.